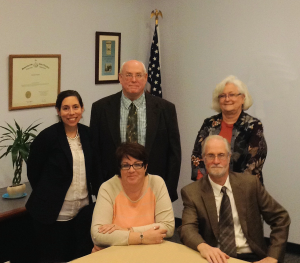 Shown seated left to right: Member Kathryn Abrusci, Secretary Richard Harty. Standing left to right: President Rachel Scelfo, Vice President Thomas Weinschenk and Treasurer Joyce Mangialino. Library policies are established by a five member Board of Trustees elected by residents of West Babylon. The five elected members of the Board of Trustees volunteer their time to plan the future of the Library by attending special workshops and monthly meetings where they evaluate crucial policies and Library activities. The challenges of the economy and the opportunities presented by technology have made their commitment to public service, education and financial oversight, more important than ever. Monday, April 29, 6 pm. The West Babylon Library Board of Trustees will meet on the above date. The public is invited to attend.